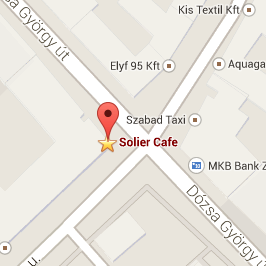 The real meeting place Solier Cafe, a cozy restaurant and a pastry shop in the center of Gödöllő! Pleasant environment friendly hospitality, delicious flavours, unique, high-quality creations, taste experiences cavalcade are waiting for you! We would be glad to help you with our catering service! 2100 Gödöllő, Dózsa György str. 13. English-language menus can be found here!